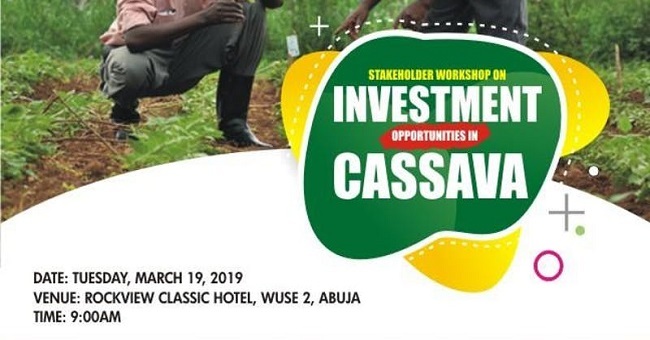 A 1- Day high-level Stakeholders workshop on Investment Opportunities in Cassava Industry Organised by the International Institute of Tropical Agriculture (IITA) Technology for Africa’s Agricultural Transformation (TAAT) Project in Collaboration with Cassava: Adding Value for Africa (CAVA) Phase II Project. TAAT is essentially a knowledge- and innovation-based response to the recognized need for scaling up proven technologies across Africa. It is a Regional Technology Delivery Infrastructure (RTDI) made up of CGIAR Centers, National Agricultural Research Systems (NARS), represented by their continental umbrella, the Forum for Agricultural Research in Africa (FARA), African Agricultural Technology Foundation (AATF), and subregional organizations (SROs), with an emphasis on agro-ecological zones and their priority commodities. CAVA II works across the value-added cassava chain, specifically focusing on a number of bottlenecks that have slowed growth and progress from previous projects: This project works directly with farmers to improve profitability of cassava sales, both through the pull of market demand and through increasing farmer yields with improved stems (working with commercial cassava seeds system grants supported by the Foundation). CAVA II adapted a combination of drying technologies that best fit the smallholder and end-use models. In East Africa, where artificial drying is new, there is a push to multiple effects of sun drying while introducing artificial drying technologies; whereas in West Africa artificial drying is been promoted by improving efficiency and decreasing cost of production.